MBA, Full Time and Flexible. The admissions committee at the University of Akron considers all of the following components of a student's application: undergraduate GPA (minimum GPA of 2.75 required), GMAT scores (minimum score of 500 required), TOEFL scores (international applicants), two letters of recommendation, a letter of purpose, resume, previous graduate and postbaccal performance, and professional association and student organization memberships. International applicants must apply at least six months prior to their intended date of entry into the program. The Graduate School of the University of Akron sponsors a diversity program to enhance minority recruitment within the MBA program. 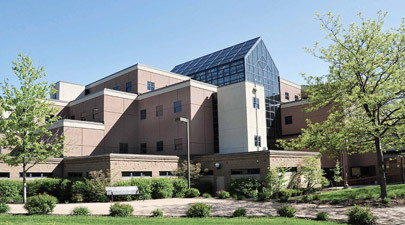 Akron is located near Cleveland’s job market, which is an immediate plus, as is the school’s “local connections with reputable companies.” The school’s Center for Career Management offers career services for all undergraduates, graduate students, and alumni. Through this office, students and alumni will have access to help with career planning, summer internships, job searching, interviewing, and resume writing. With Akron’s “strong network,” and “companies in both public accounting and industry heavily recruit­ing here, it helps make it very easy to land a job in whichever area you prefer.” School-organized career fairs give students a “chance to meet some prominent businesses” and “build [their] professional network.” Employers who have hired from the Akron MBA pool include Goodyear Tire & Rubber Company, Delloite & Touche, Babcock & Wilcox, Dominion, FirstEnergy, Enterprise, Progressive, National City Bank, and J.M. Smuckers. Standard & Poor’s Research Insight (North America and Global), Compustat ExecuComp, CRSP Financial, SAS, SPSS, LexisNexis Academic, Thompson Financial I/B/E/S, Thompson Reuters Checkpoint, CCH Business and Finance Library, Audit Analytics, BNA Premier, IBIS World, Mergent Online, Thomson One Banker, Gartner Group Reports. We also have the business application Microsoft Dynamics. Peer tutoring is provided for students in the Government and Business course to assist international students with this language intensive course. Anthony Alexander - President and CEO, FirstEnergy Corp.
Want more info about University of Akron College of Business Administration Full Time MBA? Get free advice from education experts and Noodle community members.